The highest bracket for annual income is $50 million or more. Only 74 Americans are in this elite group. The average income within this category was $91.2 million  in 2008. As astonishing as that is, in 2009 they averaged $518.8 million  each, or about $10 million per week. This means, in the depths of the recession, the richest 74 Americans increased their income by more than 5 times within this one year. In 2010 a dozen major companies, including GE, Verizon, Boeing, Wells Fargo, and Fed Ex paid US tax rates between -0.7% and -9.2%. Production, employment, profits, and taxes have all been outsourced…. the US financial system. It allows them to protect and increase their wealth and significantly affect the US political and legislative processes. 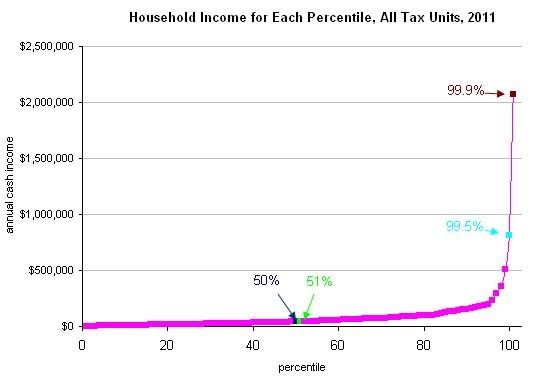 and have little likelihood of entering the top 0.5%, much less the top 0.1%…. 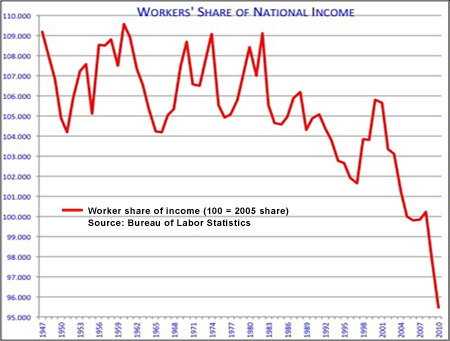 “To get into the top economic 0.01% (one-hundredth of one percent) of the population, you have to have a household income of over $27 million  per year. At some point capitalism will destroy itself, because you can’t keep shifting income from labor to capital without not having excess-capacity and a lack of aggregate demand. Michael Hudson is a research professor of economics at the University of Missouri, Kansas City and a research associate at the Levy Economics Institute of Bard College. What Prof. Hudson describes in his essay are partially my thoughts and opinions of a parasitic banking system that slowly absorbs and destroys all the savings that would otherwise be available for productive investments. The US debt problems are imo not much better than the situation in Greece. If all unfunded liabilities are included the US debt situation is probably worse since almost all 50 states have passed the point of no return. They will never ever be able to get there debt problems under control without a ” debt restructuring” the modern term for partial default. The US economy is turning down again, unemployment is understated by at least 5%. Among the African-American segment of the population, the not-seasonally adjusted U-3 unemployment rate for May 2011, including both sexes of the age group 16-19 year olds, is 40.6%. A ticking time bomb that only an Afro-American president can halt, temporarily imo. The FED ( still ) prints the world’s reserve currency. Once this outrageous privilege is lost, US “debt restructuring” is inevitable. How much longer must poor tax payers bailout rich banksters? Will Ireland really succumb to the Commission? In the Irish Bailout negotiations, the European Central Bank and the Commission had vetoed the proposal to force some of the bank losses back onto the bondholders. On Tuesday Dec 7th the Irish parliament will have to vote on the new budget. If two MPs vote with the opposition, Ireland might not have a new budget until after the general election in January. It’s a safe assumption that the present government will be ousted in January. I wonder whether the pimps in Brussel in this case have a plan B. The Irish situation is almost as hopeless as the Greek is. And its easy to understand why Germany was pushing so hard for this “bailout”. German banksters were particularly keen to lose money in the Irish property market. In plain English every member can veto the next bailout if a country is declared to be just illiquid! Hopefully Mr. Market hasn’t noticed yet and the Irish will pass a budget that meets the demands of the Commission.